Riviera Nayarit, Mexico (December 9, 2016) - With the cutting edge Teens Club and baby concierge, kids 4 to 12 could feel neglected. Never fear. And so, they now have their spacious, everything-a-kid-could-want Kids' Club at Grand Velas Riviera Nayarit thanks to a major renovation. 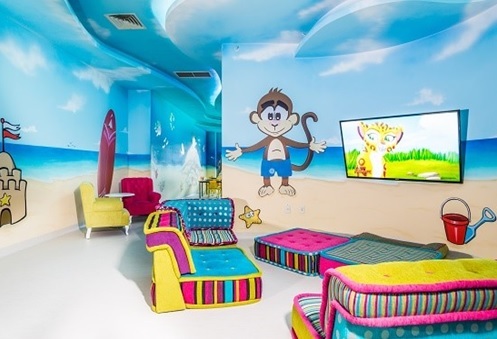 Hand-painted murals with mascot Pancho the monkey at the beach and seaside cover the walls, and ceiling with colorful, fun images set the playful mood. Areas are set aside for video games, a lounge space with extra comfortable lounge chairs for watching the large screen TV, and karaoke after dinner, and yet other areas for board games and reading. Kids also have their own outdoor garden with playground equipment and sports area, and even a private sandy beach, perfect for sand castle building. Activities have been ramped up for day and evening too, with popular ones like crafts, ball games and painting, and new options including feeding the fish, treasure hunts and mini disco complete with a disco ball and strobe lights. During school holidays and vacation time in summer, Mexican folkloric night with live music and native arts and crafts, drive-in cinema with favorite movie snacks, and magic, animal and clown shows are offered for parents and kids to enjoy quality time together. The Kids Club is open daily from 9 a.m. to 11 p.m. Meals and snacks are served in the Club and everything is included in the daily rate. Nightly rates start at $309 per adult and $100 for kids ages 5-16. Rates are per person per night, based on double occupancy. The Grand Velas resort's all-inclusive rates include luxury accommodations, a la carte gourmet meals at a variety of specialty restaurants, premium branded beverages, 24-hour in-suite service, taxes, gratuity and more. Spa treatments are an additional cost. For reservations or more information, call 1-888-407-4869, email reservations@velasresorts.com or visit http://vallarta.grandvelas.com/.